Harris v. Quin decision: The attack on home health care unions hits female workers hardest. Unions for home health care professionals took a major blow on Monday. The Hobby Lobby decision sucked up most of the media coverage of women’s rights on Monday, but the other big Supreme Court decision, in Harris v. Quinn, was yet another blow to the rights of working women. In that case, the court decided against decades of precedent allowing unions to prevent free riders by charging “fair share” fees to workers who aren’t unionized but still profit from collective bargaining by enjoying higher wages and better benefits. The court was unwilling to completely bulldoze that precedent, so the decision only affected a certain group of workers: Home health care workers who are paid by the government but work in the homes of their patients, a group that happens to be mostly female. Unions representing other public employees, like firefighters, police officers, and teachers, can continue to collect the fair-share fees. Why did Alito and his conservative brothers on the Court (literally, all 5 joining in the majority are men) rule this way? Principally, the Court bought the argument that “a home is not a union workplace.” The Court bought into the idea that the specifics of the domestic worker’s work arrangement causes domestic work to fall outside of the Abood framework. Domestic workers—mostly women of color who care for children, elderly, disabled and ill—are among the lowest-paid workers in the United States. 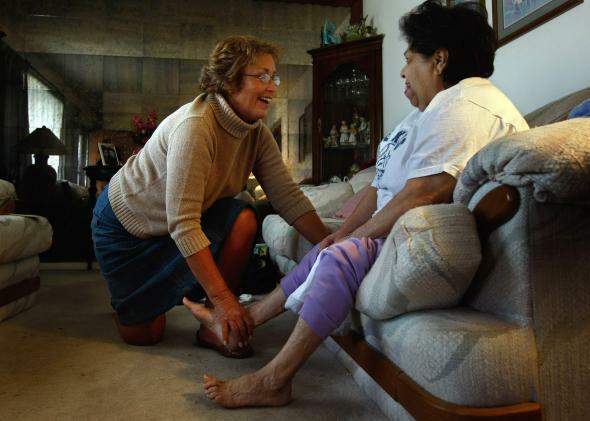 There are some 2 million domestic workers in the country, many of whom are serving the most elderly and disabled populations as part of programs like the one in Illinois. Several states have, like Illinois, established programs through which they pay domestic workers to care for their state’s most vulnerable populations. These unions have been shown to reduce worker turnover as well as improve care for those who need it most. The fact that this decision will degrade the quality of care for homebound patients is particularly ironic, as it was one of those patients, Pam Harris, who sued to end the union. Harris said she didn’t want her home to be a “union workplace.” There can be no better symbol of the Fox News generation than a person who’d rather suppress the wages of health workers than ensure the quality of her own care. This decision falls right in line with the an increasingly gendered attack on unions, with female-dominated unions such as teacher’s unions or other service industry unions getting the lion’s share of abuse from politicians and right-wing media. Part of this just reflects the changing nature of work in America, no doubt. Female-dominated industries are a growing part of the labor force and, as such, are going to attract more abuse from anti-labor forces. But, as this Supreme Court decision shows, “feminine” caring professions like teaching and nursing are still regarded not as real work, but as merely something ladies do to earn a little pin money. The result is lower wages overall for women and increasing hardships for families that rely on their incomes for more than frivolities.